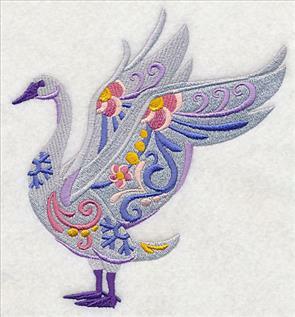 Revel in the beauty of machine embroidery with this fabulous variety of new designs. These new designs feature a rich array of subjects and styles. Winter animals get a flower power makeover. And the ever-popular "wrapped up in winter" style is BACK with nine dog breeds, all fashionably dressed in flowing scarves. 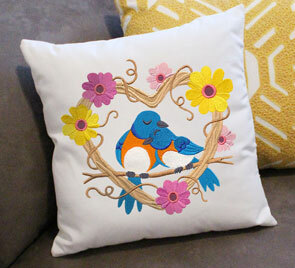 Perching lovebirds sit in grapevine hearts, and are terrific on pillows and totes. Plus, new Intricate Ink fox designs and food and drink squares, too! A tote bag gets an instant update thanks to new winter flower power animals. The first two Flower Power Pals design packs were a hit, and we received many requests for more! 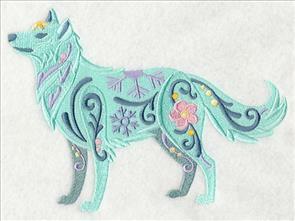 Cold-climate animals get a frosty treatment with wintry filigree and flowers. 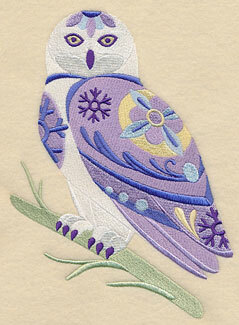 A polar bear and snowy owl stitched in this style are fabulous on shirts, totes, and more. 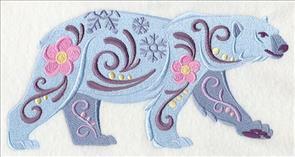 5.86" x 7.71" and 4.88" x 6.43" and 2.95" x 3.89"
These colorful, whimsical animals feature wintery blooms, bright swirls, and snowflakes for a fun and frosty look. 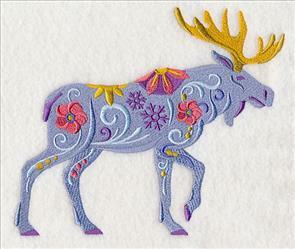 Stitch the moose and wolf below in bright colors, or muted winter hues. 7.81" x 5.80" and 6.50" x 4.83" and 3.88" x 2.88"
These flower power animals are terrific on everyday projects, and are especially adorable on kids' gear, too! 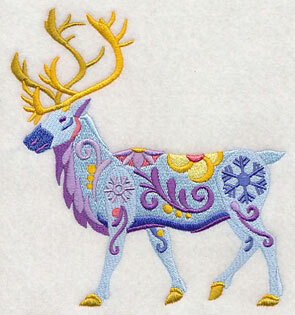 Stitch a penguin on a baby blanket or onesie; a caribou is particularly sweet on a kids' tee or burp cloth. 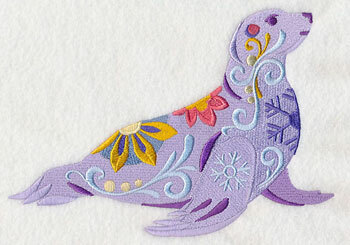 5.86" x 6.35" and 4.86" x 5.27" and 3.56" x 3.87"
Let the lively animals frolic and play on your next embroidery project! Pick your favorite from the pack to stitch on a sweatshirt or pillow, or use them all for a matching set (we particularly like the idea of creating a flower power quilt!). 5.86" x 6.31" and 4.86" x 5.24" and 3.58" x 3.87"
The bright colors, fun accents, and playful nature of these designs make them the perfect fit for kids' decor, gardening gear, kitchen projects, and more! 8.05" x 5.86" and 6.67" x 4.86" and 3.85" x 2.81"
These colorful designs are wonderful on fleece scarves and pullovers, as well as cozy quilts and pillows. Order the designs singly by using the links above, or get the whole set in a design pack for one low price! 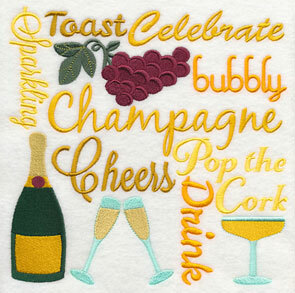 Embroiderers look forward to new "wrapped up in winter" designs every year. They're among the most popular designs on the website! This year we've added nine dog breeds to the growing collection. Click here to see the other Wrapped Up in Winter animals, including a cat, elephant, hedgehog, bird, and more. 11.00" x 4.80" and 9.41" x 4.11"
11.75" x 4.75" and 9.41" x 3.80"
7.81" x 3.16" and 6.86" x 2.77"
Each of the too-cute dogs is wearing an oversize scarf that trails behind them in the winter wind. 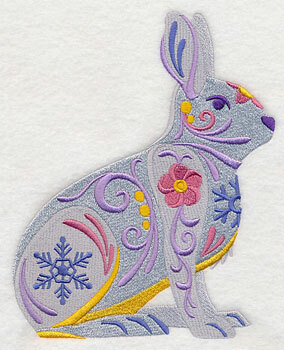 The horizontal composition of the frosty motifs makes them an ideal choice for stitching on sweatshirts, the back of fleece vests, and tote bags. 11.00" x 4.54" and 9.41" x 3.88"
11.00" x 4.25" and 9.41" x 3.64"
7.75" x 3.00" and 6.85" x 2.65"
It's one of our traditions to create new designs featuring the dogs wrapped up in scarves at the beginning of each winter season. Here a beagle and border collie fight off winter's chill. 11.00" x 4.50" and 9.41" x 3.85"
11.00" x 4.93" and 9.40" x 4.22"
7.77" x 3.48" and 6.85" x 3.07"
An English Bulldog and Old English Sheepdog are an adorable addition to your next winter project! Change the color of the scarves to match your garments, home decor, or favorite colors. 11.00" x 4.41" and 9.41" x 3.77"
11.00" x 4.52" and 9.40" x 3.86"
7.80" x 3.21" and 6.85" x 2.82"
With the winds blowing and snowflakes falling, this Bernese Mountain Dog stays cozy with a fabulous winter scarf. 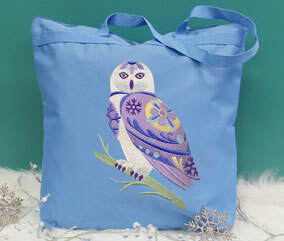 Great for children's items, winter apparel, towels, and more. 11.01" x 4.90" and 9.40" x 4.18" and 7.78" x 3.46" and 6.86" x 3.05"
Darling lovebirds all snuggled up inside of grapevine wreaths are a sweet addition to pillows, quilt squares, tote bags, and aprons. 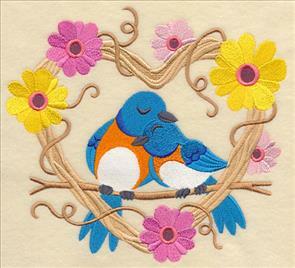 Here, a pair of bluebirds keep each other warm while flowers bloom around them. 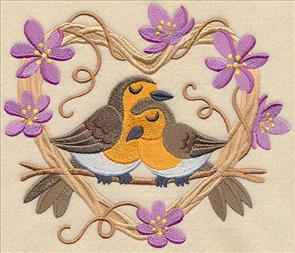 Stitch these perching lovebirds onto a pillow for a lovely addition to your household decor. 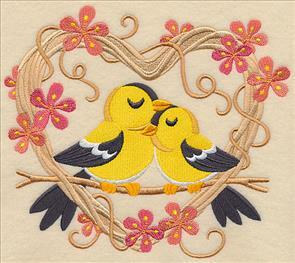 Pairs of goldfinches and European robins cuddle up inside their heart-shaped wreaths. These designs are a fabulous choice for Valentine's Day projects, anniversaries, or weddings, too! 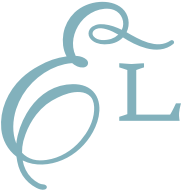 See our past lovebird designs here. 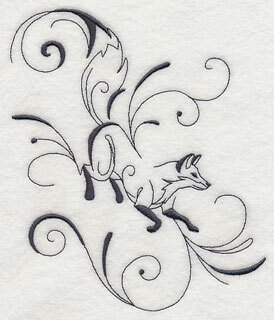 Add a graceful, contemporary look to your projects with an Intricate Ink fox! These foxy designs are a brilliant addition to the other Intricate Ink designs available from Embroidery Library, and are a stylish accent on quilts, pillows, tote bags, and more. 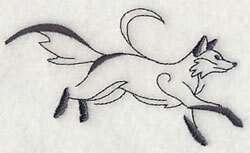 5.85" x 6.37" and 4.85" x 5.28" and 3.52" x 3.85"
An elegant fox runs and frolics across this inky border. 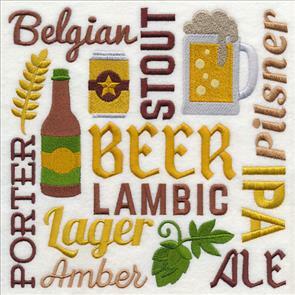 The combination of thinner and thicker swirling lines embodies the look of tattoos or freeform artwork, and is a whimsical addition to any embroidery project. 9.40" x 3.26" and 6.00" x 2.42" and 3.85" x 1.34"
This inky corner design and accessory are terrific on napkins, pockets, or placemats! 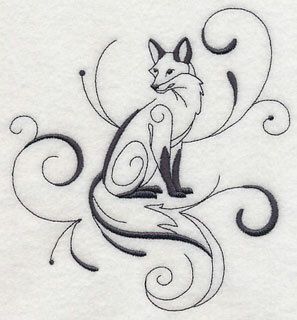 Stitch with the other Intricate Ink fox designs, or use singly for extra impact. 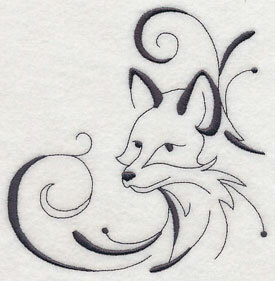 Add a beautiful, whimsical inky fox to shirts, table linens, tote bags, and more. 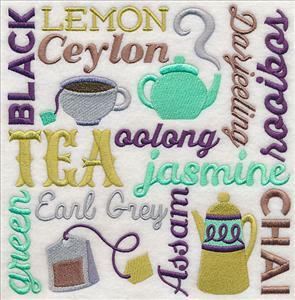 Whether you're a coffee lover or a tea fanatic, you'll swoon over these fabulous square designs! Not only are they a tasty way to celebrate your favorite hot drink, but they're terrific additions to kitchen decor, aprons, or placemats, too. 7.72" x 7.81" and 6.91" x 6.99"
5.86" x 5.93" and 4.86" x 4.92"
7.66" x 7.82" and 6.91" x 7.05"
5.86" x 5.98" and 4.85" x 4.95"
Wine aficionados, rejoice! 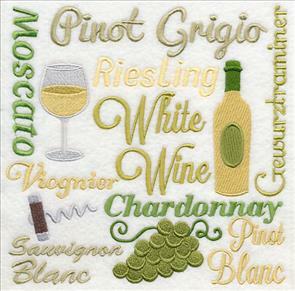 New red and white wine designs feature vino varieties, wine glasses, and bottles to make up these elegant squares. 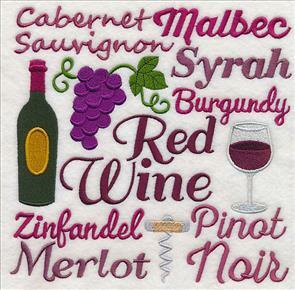 We love the idea of stitching these designs on a store-bought wine bag or wrap (or learn how to make your own!). 7.81" x 7.61" and 7.09" x 6.91"
6.01" x 5.86" and 4.99" x 4.86"
7.81" x 7.74" and 6.97" x 6.91"
5.90" x 5.85" and 4.90" x 4.86"
The sweet squares are the perfect ingredients for making kitchen-ready embroidery projects. 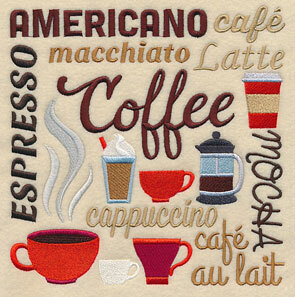 Use to adorn a framed piece, tea towel, or seat cushion. 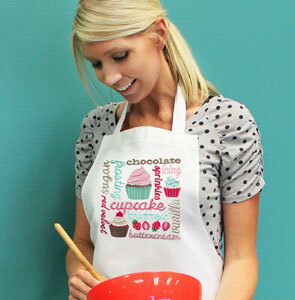 especially love it on an apron! 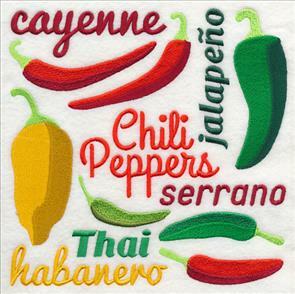 Things are heating up with these salsa and chili pepper designs! 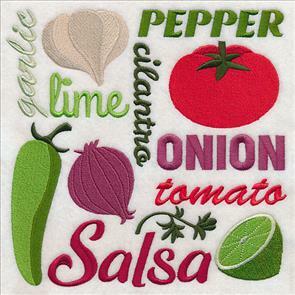 They're spicy embroidery embellishments -- stitch together, or pick your favorite. 5.98" x 5.85" and 4.97" x 4.86"
7.81" x 7.76" and 6.90" x 6.85"
5.91" x 5.86" and 4.86" x 4.83"
Celebrate the New Year with this fabulous champagne design, or embrace your inner brewmaster with a beer version. 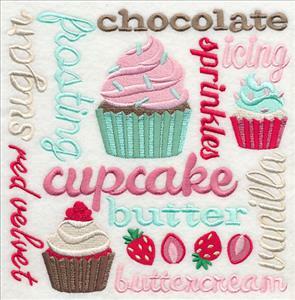 Great on a wide variety of embroidery projects! 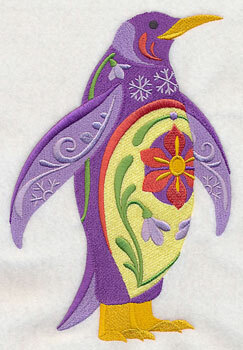 Joy is making a quilt using the animal sketch designs, and was hoping we'd add a wood duck version to the site. Thanks for the suggestion, Joy! 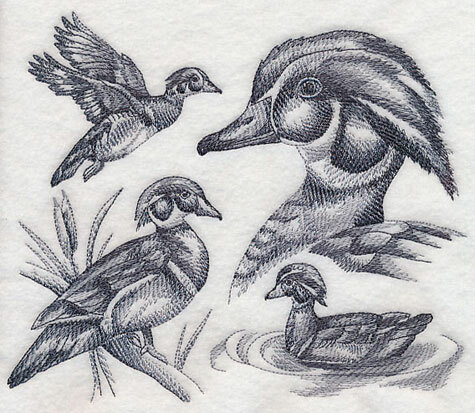 This sketch shows the wood duck in four poses, and is a quick-stitching addition to any embroidery project. 7.76" x 6.56" and 6.91" x 5.85" and 5.74" x 4.85"